By LUDWIG VON KOOPA - My Nintendo has been underwhelming in general. Let me first say that today, December 13, is one of my least favourite days of the annual cycle. It's down there with Tax Day (April 15) and Daylight Savings Time (second Sunday of March). That's not just a weird opinion I'm having just to be contrarian for a KoopaTV opinion — I've been saying that offline and online for some time now. I'm just in total AGONY this whole day. December 13 happens to be my birthday. (And December 13 is also site-inspiration Herman Cain's birthday.) 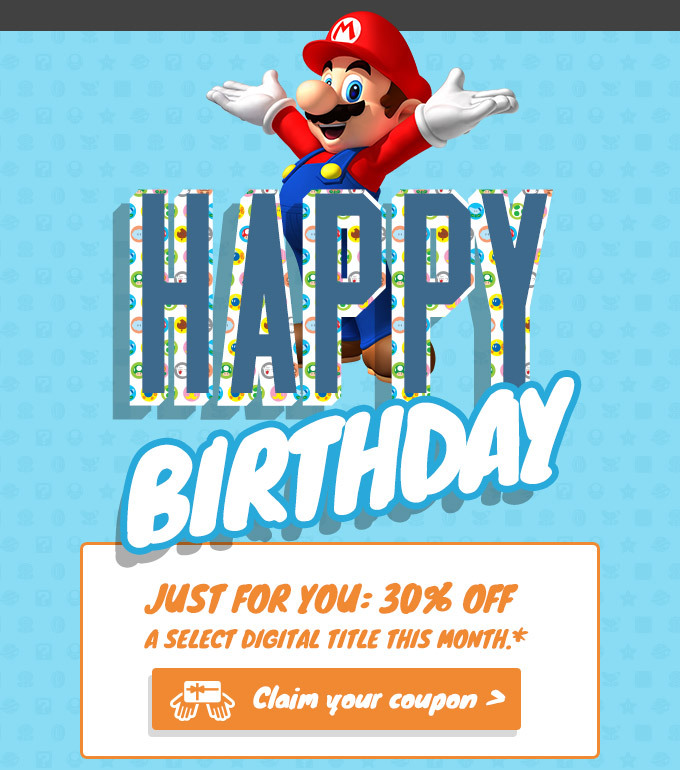 In recognition of that, the good ol' folks at Nintendo are giving me a special JUST FOR YOU offer for their My Nintendo service: 30% off a select digital game*! Ugh, like the likes of MARIO would ever wish me a Happy Birthday. Am I even gonna use it? Probably not. I haven't exactly been using My Nintendo at all. The only way my coin/point count is going down is not because I'm redeeming their deals, but because the points are expiring. I've had 1380 Platinum Points expire, with another 480 set to expire at the end of this month. There's just nothing interesting to use them for. It appears my Mii on My Nintendo never changed after my Miiverse ban and its drastic Mii change. I miss Club Nintendo. I miss physical rewards. I also miss getting points for physical games. AND, I miss filling out the surveys that Nintendo off-and-on-again chose to pay attention to. Why, thank you very much for that question. What, do you want us to ship you a KoopaTV mug for free? No way. If you wanted that, you should've bought it when you had the chance. We're not paying shipping. In the meantime, enjoy your digital rewards. Instead of Club Nintendo surveys, KoopaTV offers Feedback Forms (and Quizzes). I assure you that we read all of your responses. But, yeah, I really don't care about Miitomo clothes (does anyone?) or generic 3DS home menu themes (I wasted enough money getting the Ace Attorney ones that I forced myself to care about). I'm personally not the kind of person to redeem points for a discount for a game I would not otherwise buy. I'd take advantage of it if I already was going to purchase that game, but most of these games are... really old, and if I wanted them I would've bought them a long time ago. Obviously, Nintendo doesn't like that attitude, since the whole point of the discounts is to give people “rewards” in the form of getting them to spend money they wouldn't otherwise spend. If they're not doing that, then it defeats the point — since I don't think anyone feels like a special valued customer because of Nintendo's My Nintendo program, even if they insist the 30% discount on a select digital game (expiring the same month) is JUST FOR ME! KoopaTV's Loyalty Rewards Program similarly aims to increase site activity to do desirable things that I assume people wouldn't otherwise do if I wasn't bribing them. But, hey, it's all free for you here. (Not for me, though!) It's just your time, and you get (almost) immediate feedback and attention from a guy with self-inflated importance, win or lose! That's its own reward, right? Ludwig is already mentally suffering from the prospect of getting even older than he already is, so please make your comments on the delicate side. That said, he's also curious if you've had a much different experience with My Nintendo than he has, though he suspects you haven't. In 2013, Ludwig flat-out just wrote an article saying it was his birthday and that he got Pokémon X. Early-installment weirdness? Ludwig wrote about gift-giving for near-his-birthday in 2014, but you can no longer give gifts to people this way. Ludwig spent his birthday in 2015 unsuccessfully trying to rally Super Smash Bros. Melee to victory over Undertale in the GameFAQs Best. Game. Ever. 2015 contest semi-finals, which is an awkward thing to tell other people when they ask what you did on your birthday. Back in Club Nintendo, you could also spend the virtual points on getting games, not just discounts for games. 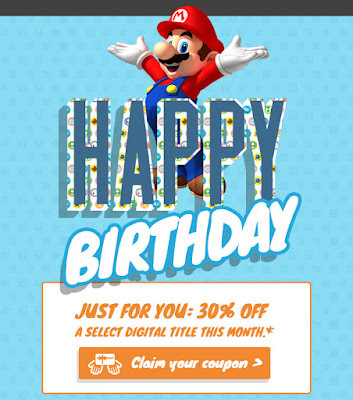 Ludwig revisits the My Nintendo birthday offers in 2018. Guess which games are still being discounted even then? This really has been getting worse as time has been going on. Early Club Nintendo > Late Club Nintendo > My Nintendo. My Nintendo needs to switch back to Club Nintendo immediately. I miss the great physical merchandise as well as the platinum level rewards at the end of the year. I don't even care if I have to fill out longer surveys. I would do anything to get that program back. Well, the name doesn't really matter, but if they were willing to have that old Club Nintendo sense of how things work, they would've done that from the beginning. It's impossible to get a sense about how much more financially beneficial My Nintendo is than Club Nintendo... if at all. Maybe it's not. I dunno, I want to get a sense of how the average fan uses it. Meanwhile I got an invite to the Switch event at Nintendo NY from My Nintendo but it seems all the tickets are claimed by the time I got home and now I am on a waiting list. It's also around my due date so not a good idea anyway. Now THAT'S a "just for you" event! I've briefly read that "select" My Nintendo members would get that, and it seems you're select based on geography. The only message *I* got in my My Nintendo-associated e-mail was that Yahoo! is just now telling us they got hacked ANOTHER TIME three years ago, and to take security measures. PROBABLY A BIT TOO LATE FOR THAT. I'm fine with digital content, actually, I think it is valuable and convenient for rewards. I liked how Club Nintendo rewarded with actual Virtual Console games instead of the little bits and pieces we've been getting with My Nintendo, though. It's more just the discounts which are a lame idea of a reward, I say. Thankfully, I didn't farm platinum points via Miitomo like some people, they must feel pretty fairly foolish for having exhausted time on that thinking they'd be rewarded. lol, I totally remember how people were getting Miitomo just to farm these totally worthless points. They thought that if you DIDN'T get it, you'd fall way behind the expected rate of rewards. Physical stuff is neat, too, no doubt about it. But I personally think that the handiness of Virtual Console games is an effective counterweight the fact that they are incorporeal. ...You have a point there. I'm totally okay with stuff like Virtual Console games being digital. It helps that they have low file sizes. I still don't like buying current-generation games digitally, though, and My Nintendo only gives you rewards for doing that. ...And the rewards themselves are more of that. Nintendo Laying Down The LAW On Fan Games! Almost-Christmas Murder Cases Stun Los Angeles! The Wonderful 1237's Advertisement Video! We're Hiring Roxy, With KoopaTV! The Game Industry's Diversity Problem: A MYTH! Jimmy Fallon Debuted the Nintendo Switch?! KoopaTV's Live Reactions to The Game Awards 2016!